Please join us as we commemorate the 100th anniversary of the end of World War 1! 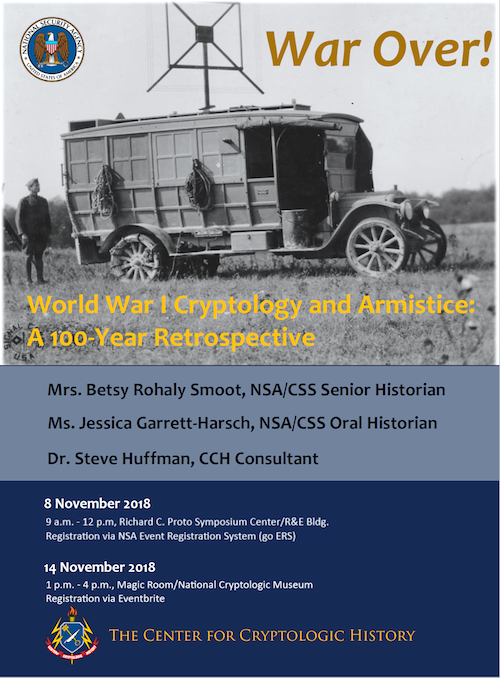 Three historians from NSA’s Center for Cryptologic History (Mrs. Betsy Rohaly Smoot, Ms. Jessica Garrett-Harsch, and Dr. Steve Huffman) will speak on a range of interesting topics to include our early advancements in cryptology in support of operations, oral histories of some of our past stalwarts, and the first uses of Native American code talking. Free event, registration required. Please register for the event via EventBrite - see link below.